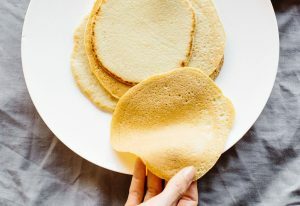 The first time many people eat or make their own gluten free breads, buns or wrap, they are disappointed with the result, because the quinoa, rice or coconut flour bread doesn’t taste like their preferred wheat based breads do. The textures and tastes of gluten-free bread, bun and wrap options will be different, so it just means it takes some getting used to. Be patient and be willing to experiment a little to find the ones that you and your family love. One of the more frequent requests we get from our readers is for gluten free bread, bun and wrap recipes. So we’ve been collecting and creating some new gluten free friendly recipes just for you. Many of the following bread, bun and wrap recipes are great for a quick and convenient lunch and they make the transition into a gluten free lifestyle much easier. The following bread recipes are so simple and easy to make. 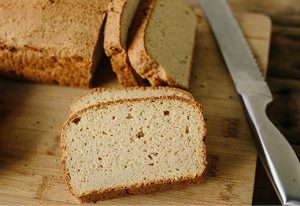 These breads make a great replacement for those store-bought GF breads that can be filled with chemicals, additives and preservatives that are only there to pro-long the shelf-life and stop it going mouldy and stale. However, these ingredients can negatively impact your health. 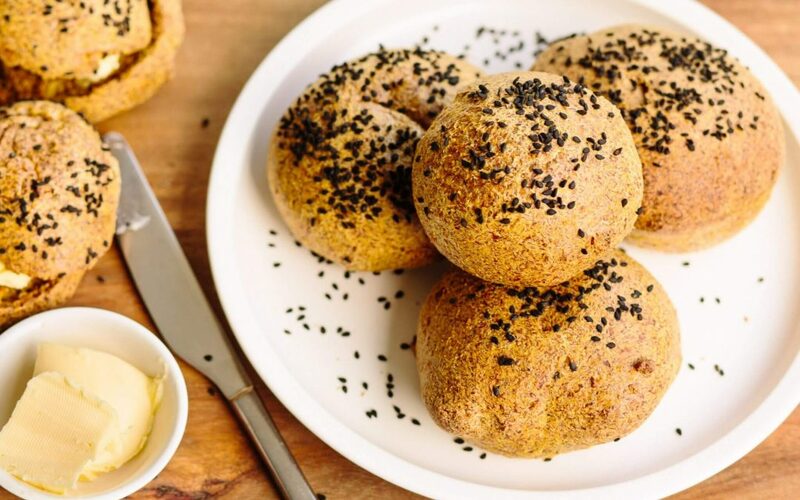 The bread recipes below are high in fibre, protein and healthy fats so they won’t spike your blood sugar levels as quickly as refined store-bought versions do. So you will feel satisfied longer by eating these homemade breads. They make a beautiful sandwich (best when fresh/ toasted), simply add on your favourite toppings, make french toast, a BLT, or a toasted sandwich. These buns are extra fluffy and so easy to make in just 5 minutes! These will be perfect for BBQ lunches or dinners, simply serve them with homemade burgers, bacon, salad, avocado and mayo for a delicious and healthy hamburger. We love these gluten free wraps because of their versatility. You can use them to wrap around your favourite sandwich ingredients, layer them into a casserole type dish to act as a ‘gluten & grain-free’ lasagna, or get really creative with your toppings. You can do a breakfast style wrap with bacon, eggs, avocado or spinach. If you’re looking for a sweet variety, you can top them with fruit, cinnamon and yogurt for something a little different. The possibilities are endless. 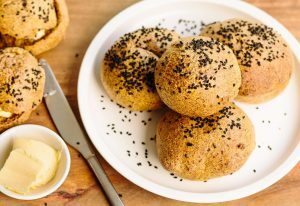 What are your favourite gluten-free bread, bun and wrap recipes? Please share them with us in the comment section below. I made these golden bread buns and they rose beautifully. But when I opened them up the top part was hollow. Just the top “shell” was there and the rest had sunk to the bottom. What did I do wrong? Hi Elizabeth, hmmm to be honest we’re not 100% sure as ours turned out perfectly. Perhaps it has something to do with your oven, they could have heated up too quickly causing them to bubble perhaps? Have you tried them a second time with any success at all? I have heard it is safe to eat sour dough bread when going gluten free, is this true? I am not celiac, I have hashimotos and just trying to change my diet, also are oats ok? This looks fantastic, I have not been able to get or make decent bread since I left Newcastle, please could you add me to your email list and send these recipes there. At the moment I have a thousand questions to ask you!!! Looking forward to hearing from you soon!!! What about Daves killer bread? Or Ezekiel bread? Hi Faye, just curious, what is Dave’s killer bread?